Today, Google News is making it even easier to follow the latest stories on whatever subjects interest you. We are happy to announce our Custom sections directory, which gives users of some of our English-language editions the expanded ability to create comprehensive sections to put on their Google News home page or share with other users. One of the great things about online news is the ability to filter by topics. Google News has long recognized this so we've allowed users to track articles based on keywords of their choice. But it has been a little tricky at times. 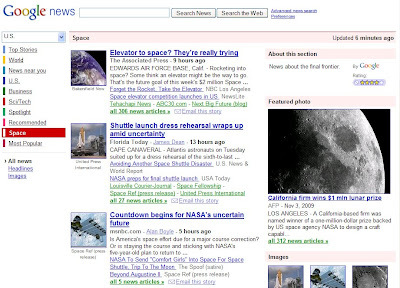 For example, to follow news about topics related to outer space, you would have to create a pretty complex filter. Now, if you're using Google News and can't find the perfect section, just create your own! You can do that by adding the relevant keywords. Then, if you are happy with the resulting section, you can publish it to a directory so others can benefit. We have created an initial set of sections to get you started. There's one on Space, and others on topics such as U.S. Foreign Policy, Global Trade, Solar Power, and Hollywood. If you like them, click on "Add this section" and they'll appear on your home page. The feature is currently available in the Google News editions for Australia, Canada, India, Ireland, New Zealand, the United Kingdom, and the United States, and we look forward to expanding it soon. Please visit our Help Center for more information on how to subscribe to custom sections or create them.